A poolscape is a fully integrated pool environment that includes not only the water, but also a full array of add-ons, accessories, landscaping, furniture and more. The idea is to broaden the concept of your swimming pool into more than just swimming. Today's pool owners are taking full advantage of the investment they've made by adding a variety of options that allow them to enjoy their new lifestyle as pool owners. 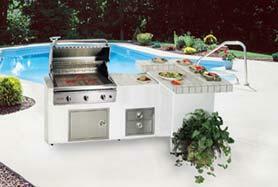 Below are some examples of items you can use to create a fully integrated poolscape. 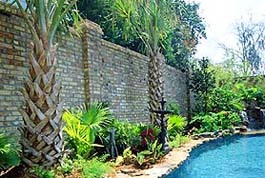 Safe and secure -- by adding an attractive fence to your poolscape, you increase security by helping to prevent outsiders from entering the area. There are a variety of styles and colors to choose from. This is a relatively new concept to poolscapes. 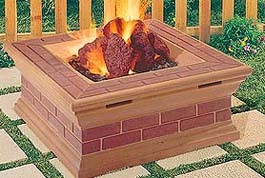 Fire pits allow you to enjoy a naturalistic approach to your pool. Imagine the possibilities . . . roasting marshmallows, cuddling with your spouse, etc. Nothing beats a good cook-out. A free-standing or permanently installed grill makes for a great addition. Can't you just smell the aroma of charcoal as you grill those juicy burgers?